A big part of creating a good user experience is choosing the right defaults. A calendar is a particularly striking example. 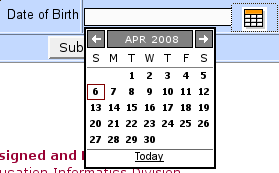 When you use a calendar widget to fill in a date, the context should determine a reasonable default date. If you were booking a plane ticket, today's date would be a nice default. This was found at http://aieee.nic.in/AIEEE2008/online/check.aspx which is a page for an exam in India. Now who gives an exam on the day they are born? This should ideally be 1990 since the majority of people giving this exam will be 17/18 now.